Gooding announced a collection of 12 Porsches from a private collection for the Amelia Island sale in March 2018. Highlights include a 959 Komfort and a Carrera GT. 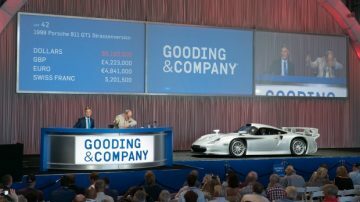 Gooding has a very good reputation with Porsches at Amelia Island classic car auctions and in 2018 is likely to build further on that tradition. The James G. Hascall Porsche Collection include 12 exceptional Porsches that will be offered without reserve at Gooding Amelia Island 2018. 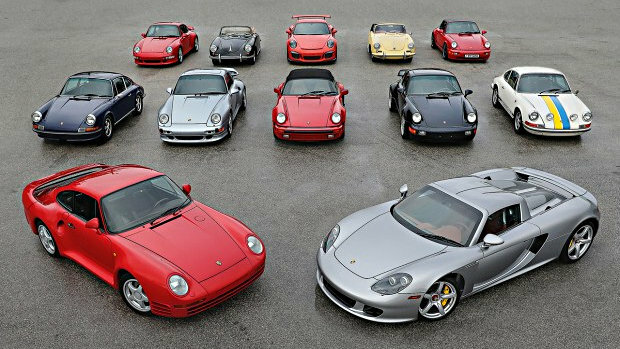 The two top cars in this collection are a low-mileage 1987 Porsche 959 Komfort (Estimate: $900,000-$1,200,000) and a very low-mileage 2005 Porsche Carrera GT (Estimate: $800,000-$1,000,000). Gooding announced 12 exceptional Porsche collector cars from The James G. Hascall Collection, which are being offered without reserve at the Amelia Island Auction 2018. This collection spans over 50 years of Porsche models and offers some of the marque’s most desirable cars. Mr. Hascall was a dedicated and diligent collector who began buying Porsches in the 1980s. He and his wife shared a true passion for the marque and participated in numerous road rallies in their cars. The ground-breaking Porsche 959 took the world by storm when it debuted in the mid-1980s. With twin turbochargers, 4-wheel drive, and a host of electronic systems that are still in use in modern Porsches today, the 959 was far ahead of its time. These supercars are capable of nearly 200 mph and can sprint to 60 mph in 3.7 seconds. The 1987 Porsche 959 Komfort (Estimate: $900,000-$1,200,000, Without Reserve) on offer at Gooding Amelia Island 2018 was formerly part of the famed Matsuda Porsche Museum in Japan and is one of only 242 Komfort models produced. With its striking livery of Guards Red over a tri-color cloth interior, this stunning example currently displays under 7,400 kilometers. This low-production supercar offers a great opportunity to own an outstanding low-mileage 959. Porsche 959 Komfort models generally sell for just above a million dollar – reserve margins usually prevent lower deals on good examples. The car on offer should be helped by its low mileage. The Carrera GT was unveiled as a concept at the Paris Auto Show in 2000. (The concept car was one of the Jerry Seinfeld Collection cars that failed to sell in 2016.) More exotic than any road model Porsche had produced, high interest in the model encouraged Stuttgart to commit to a limited-production run of just 1,270 examples. This 2005 Porsche Carrera GT (Estimate: $800,000-$1,000,000, Without Reserve) was purchased new by Mr. Hascall and is finished in the stunning color combination of GT Silver Metallic over a Terracotta interior. Mr. Hascall sparingly enjoyed his supercar, and the odometer currently shows less than 120 miles. Offering an optional open-air driving experience, and a manual gearbox mated to a normally aspirated V-10 engine, this extremely low-mileage Carrera GT is a fine example of one of the greatest analog supercars ever produced. Porsche Carreras are frequently seen at auction but thus far only Mecum has managed to achieve over a million dollar on this model: three consecutive years at Monterey – 2015, 2016 and 2017. The very low mileage may put this Carrera in with a change of joining the million-dollar club. RM Sotheby’s also recently announced a special collection of Porsches for its Amelia Island 2018 sale. The Exclusively Porsche Collection includes eleven Type 964 Porsche 911 models from a private collection while Gooding is also likely to offer several further high-performances Porsches at the Amelia Island sale.